June Hudson is the town’s doctor, a caring, capable woman who now has a bit of explaining to do. People are beginning to notice the bloom in her cheeks—and the swell of her belly. 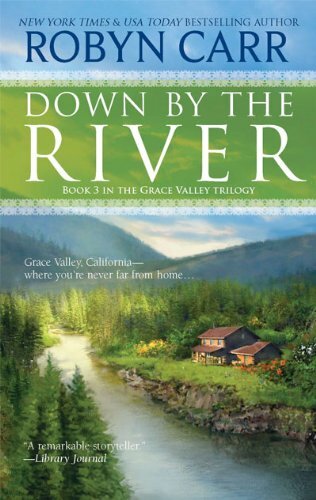 Happily, DEA agent Jim Post is back in June’s arms for good, newly retired from undercover work and ready for new beginnings here in Grace Valley. Expecting the unexpected is a way of life in Grace Valley, and the community is overflowing with gossip right now. Who is the secret paramour June’s aunt Myrna is hiding? Does the town’s poker-playing pastor have too many aces up his sleeve? But when dangers, from man and nature, rise up with a vengeance to threaten June and the town, this community pulls together and shows what it’s made of. And Jim discovers the true meaning of happiness here in Grace Valley: there really is no place like home. “Who was that man?“ her eighty-four-year-old aunt Myrna wanted to know. June glanced over her shoulder at the man in question. Jim. He yawned largely and began to scratch his chest. Ah. So she hadn’t dreamt it after all. He was here, beside her, in the flesh, after being away so long. Aunt Myrna wasn’t the only one who knew nothing at all about her secret lover. With just a couple of exceptions, the whole town had been kept in the dark. She was going to have a lot of explaining to do. He lifted one brow, amused. “Too many details?“ he mimicked. “He’s a character, isn’t he?” Jim asked. While she waited for the hot water, she looked at her profile in the mirror. Her waist was fast disappearing. A year ago she was the thirty-seven-year-old town doctor, single and without a prospect in sight. Six months ago, though she had a hot prospect, she was pretty sure she’d be childless. A few months ago, her prospect became even more serious and words of love were said along with desperate goodbyes. Two weeks ago her tummy was reasonably flat, but the moment she found out she was four months pregnant, her middle began to strain at her waistband. Then, approximately the second Jim returned home for good, home for her, she blossomed. Now she had a nice little round belly growing. Last night, as the weekend Harvest Festival was breaking up and the last revelers were dancing, he appeared out of nowhere. It was as though the entire festival, the entire town had disappeared, and it was only the two of them, embracing, touching, kissing. And then, without making any proper introductions, they’d gotten out of there as quickly as they could. But how naive. The town hadn’t disappeared; the town had watched. She heard the phone ring again and knew the whole town was going to call her this morning, asking for the facts. She should probably be grateful they hadn’t started calling last night. The actual truth—which they wouldn’t be telling anyone—was that June had met Jim last spring when he brought a wounded man to her clinic, late at night, wearing a disguise, and held a gun on her while she removed a bullet from his comrade’s shoulder. Call it intuition, but she had never quite believed this big handsome man with the beautiful sparkling blue eyes could be a criminal, though he certainly appeared the part. 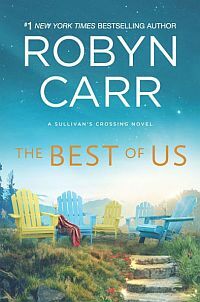 Shortly thereafter, right about the same time she fell helplessly in love with him, he admitted the truth—he was an undercover DEA agent, working inside a cannabis farm deep in the mountains, a farm they were getting ready to bust. After the raid, Jim was sent on one final assignment before retiring from a successful career in law enforcement. Neither June nor Jim realized they already had a baby started. June, a small-town doctor raised by her father, the town doctor before her, was always busy thinking about the health and welfare of other people. Even though she’d been nauseous, sluggish and suffered through crying jags—something she’d never before experienced—she hadn’t suspected a thing. By the time she described her symptoms to her business partner, John Stone, she was well along. “I remember,” he said, giving his head a nod. He was sitting up in the bed, sheet to his waist, and he held a cup of coffee. June’s collie, Sadie, who was not allowed on the furniture, was curled up on the bed at his feet. When she lifted her head to regard June, she seemed to have taken on regal airs. “Shows what you know,” he said. She slowly opened the bath sheet. There it was, a protuberance that, much too soon, would be screaming for her supper. His eyes grew warm as they caressed her new shape. “It’s time you met my family and friends,” she said. Suddenly, inexplicably, she felt her face grow hot. Married? Right away? What did she really know about him, besides that she loved him madly and he snored? So much was still a mystery. She wasn’t about to marry him before she had a few more details. “Is that true?” she asked. June and Jim rode toward town in her little pickup truck. Sadie usually had the seat Jim was occupying, and June wouldn’t even talk about putting her in the back, so Sadie was squished between them. June dialed up John on her cell phone. “I wish,” she answered, and laughed in spite of herself. June slowed as she came around a curve and encountered a disabled truck up on a jack by the side of the road, its left rear tire missing. The vehicle was old and overladen with bundles, boxes and a couple of child-size mattresses. Two little kids, either girls or boys who hadn’t had haircuts in forever, stood behind the pickup. They were ratty-looking and dirty and wore forlorn expressions. They didn’t wear jackets, though the early morning air was cold. If they were underdressed, there was a good chance they were also underfed. There was no tarp to cover the family’s goods and the sky was threatening. It was October and soon the rains of winter would begin and not ease up until late spring. A family of modest means, all their worldly goods loaded in a truck, trying to find a place to start over, was not an unusual sight on the roads surrounding the valley. With the cold weather came the cessation of logging and a slowdown in construction.